The roller board design of this Mobile Bench Easel from Martin Universal Design makes it ideal for outdoor use. 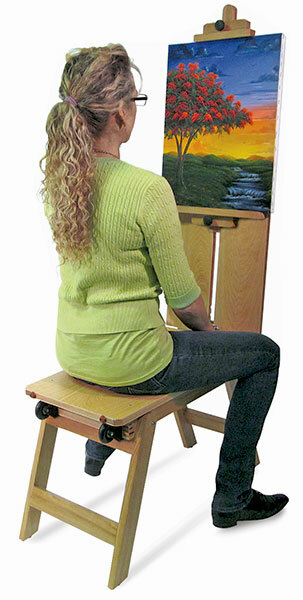 Made of hardwood, the easel features a durable veneer finish, a comfortable 18"H × 14"W × 24¾"L (46 cm × 36 cm × 63 cm) bench seat, and an adjustable, angled canvas holder that accommodates canvases up to 24" (61 cm) high. The easel's thin profile when folded allows it to be stored in a trunk, closet, or corner when not in use. The easy-grip handle retracts when not in use. Magnets keep all of the bench's components secure when folded.